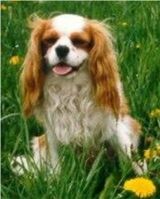 The Cavalier King Charles Spaniel is gentle, friendly and affectionate. Being lovable, energetic and intelligent, they make great pets for families with children and other pets – who they normally get on really well with. These toy spaniels are very popular and easy to keep as they adapt to your lifestyle, making no particular demands; the Cavalier King Charles Spaniel makes for an excellent family pet and is well suited to those with smaller accommodation. This small spaniel was once a favourite breed of Charles ! !, but lost favour when William of Orange succeeded the throne in England. Much later in Victorian times, dog styles generally changed towards shorter forefaces and smaller dogs, hence the style of dog which can be seen in 16th and 17th century paintings, all but disappeared. 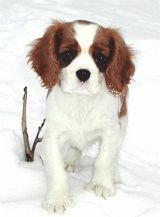 The Cavalier King Charles Spaniel has uncomplicated exercise requirements and will adapt to the families activity level. Equally happy on a long walk as a short jaunt.